Last Monday’s news that undrafted University of Maine defenceman Brady Keeper signed with the Florida Panthers may not have made much of a splash around the hockey world, but it was cause for raucous celebration in Cross Lake, Man. Students were dancing outside of Mikisew School after Keeper became the first person from the Pimicikamak Cree Nation to make it to the NHL. 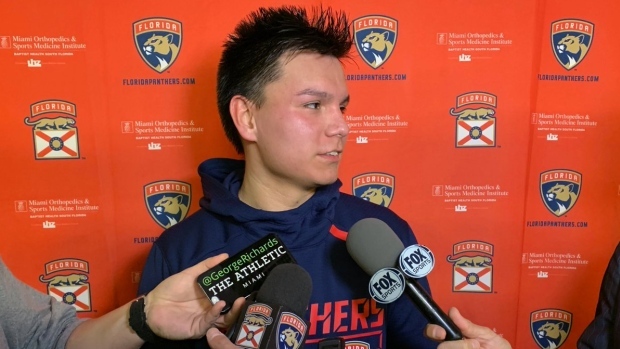 Keeper, 22, joined the Panthers for their morning skate last Tuesday in Dallas and coach Bob Boughner said he expected to work him into the lineup in the coming days. He will make his NHL debut Thursday night against the Senators in Ottawa. It may be equally as unbelievable for kids back in remote Cross Lake, a reserve 10 hours north of Winnipeg. Cross Lake became a national story in Canada in 2016 when five teenagers in the community committed suicide, while 140 others attempted suicide in the weeks that followed – prompting Cross Lake to declare a state of emergency. Keeper’s story is a breath of fresh air, an enormous positive for an entire generation of indigenous youth. Keeper’s path is incredible. In less than two full seasons, he will have risen from the Manitoba Junior Hockey League to the NHL. But his dream almost ended before it began. Keeper wanted to quit after exactly two days of summer classes at Maine in 2017. He booked three or four flights back to Manitoba – maxing out his credit card in the process – but he never got on the plane. Instead, he leaned on Tootoo for guidance. Like Tootoo, Keeper played for the MJHL’s Opaskwayak Cree Nation (OCN) Blizzard in the MJHL, where he first popped up on the radar of scouts. Pictured: Brady Keeper, son Navyn, girlfriend Shaylyn and stepson Napesis. Keeper was already father to a baby boy and stepfather to another when he arrived on campus in Maine at the age of 20. Grillo only needed to see two periods watching Keeper one night in Portage, Man., to know that he wanted to represent him. At 6-foot-2 and 194 pounds, Keeper is a dynamic defenceman who netted 44 points in 73 games at Maine. He hit five posts in last weekend’s season-ending series at Northeastern University in the Hockey East playoffs. He managed to fly relatively under the radar as a junior player after a playoff loss that kept the Blizzard out of the RBC Cup, Canada’s Junior A national championship. 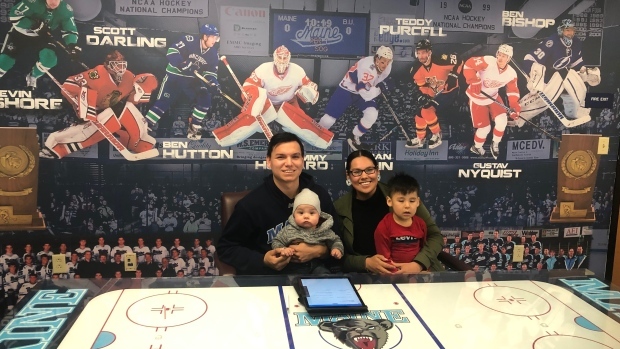 More NHL teams would have been onto him then, like they were to fellow Aboriginal player Zach Whitecloud, who signed with the Vegas Golden Knights last year as an undrafted free agent after his sophomore season at Bemidji State in Minnesota. Grillo kept telling Keeper to follow Whitecloud’s path. More than a handful of teams were interested in signing Keeper, but the Panthers were in on him the earliest. They tried to convince him to leave Maine after his freshman season. Keeper said it was a tough decision because the coaches at Maine “treated me like I was their own son.” But his dream and dollars awaited. Money was tight - Keeper had exactly 63 cents in his bank account on Monday when he signed. A mentor paid for Keeper’s baggage fees at the airport in Maine just to send his sticks and equipment on to Florida. With the stroke of a pen, Keeper is guaranteed almost $300,000 over the next four months. He earned a $92,500 signing bonus on Monday, will make almost $95,000 in the NHL over the next 19 days, and is then due another $92,500 in signing bonus on July 1. Tootoo said all of northern Manitoba just became Panthers fans. Tootoo said he couldn’t think of one other player from that region to make it to the NHL. Keeper mentioned Konrad McKay, from nearby Wabowden, Man., as an enforcer who fought his way to a six-game run in the AHL. He said his next-door neighbour, Lynette Kryminski, also climbed to the Div. III ranks in the NCAA. So Boughner has now called his No. 25 and Keeper will be the first to star in The Show.